For years, collectors had speculated that Revenge of the Jedi figures were issued on card. Although no production Revenge of the Jedi figures ever made it to market, that didn't stop periodic rumors that some made it to store shelves. These rumors are false. Collectors settled for the next best thing--Revenge of the Jedi proof cards. Proof cards are slightly different than the cards used on production figures, but a number of Revenge of the Jedi proof cards have made it to the secondary market. 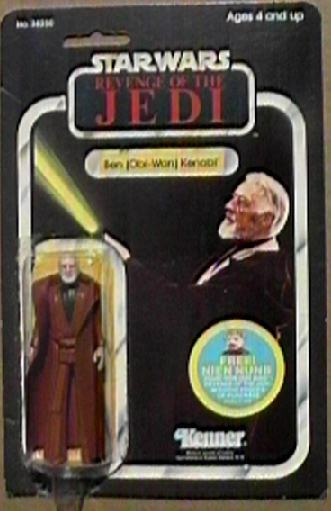 This carded Ben Kenobi was a Toy Fair sample in February 1983 before the movie was retitled to Return of the Jedi. It was constructed by Kenner from a proof card and an ESB carded Ben Kenobi to show the new look of the upcoming line. The bubble was pulled from an existing ESB Figure, trimmed and reattached to the Revenge proof card. Unlike some of the other figures, this one did not have velcro tabs on the back for attachement to the Toy Fair display. These figures were pretty crudely constructed by some Kenner sales folks and were meant only to be representatives of what was on the horizon and not as some production -quality merchandise. The movie was retitled before any production cards, with the Revenge logo, were made. Now, one would have to be crazy if they saw such a piece sitting on a random dealer's table where the dealer claimed it was a prototype for the Revenge of the Jedi carded figures. This piece came directly from a former Kenner employee and is 100% real (or otherwise it wouldn't be featured here as authentic). Without complete documentation proving it was an original, it would not be advisable to buy a similar piece since it could be easily faked (dealers have faked such carded figures for years). Only seven Revenge sample carded figures are known to exist today and all came from this same source. They are: Cloud Car Pilot, Ben Kenobi, Chewbacca, 4-LOM, 2-1B, Lando Calrissian, and IG-88. It's unfortunate that at least two of these figures ( Cloud Car pilot and 2-1B ) had already faked by a dealer several years back. This is why it's imperative that you don't blindly purchase such an item unless you know for a fact that it's legitimate.